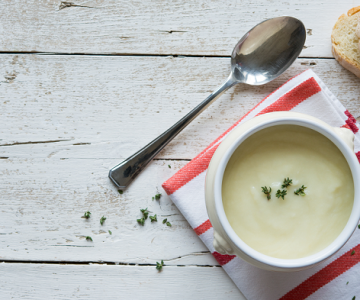 Helping use Sunday roast leftovers, this spicy parsnip soup will help warm you up on a chilly day. 1) Melt the butter in a large saucepan over medium heat. 2) Fry the diced onion in the butter until soft and then add the parsnips, garlic and curry powder. Fry all the ingredients over a low heat for a couple of minutes to release all the flavours then add the stock to pan and stir well. 3) Simmer the soup for 15 minutes until parsnips are soft. Off the heat blend the soup with a hand mixer or food processor until smooth. 4) Stir in the cream and season with the salt and pepper. 5) Serve with a sprinkle of paprika and chopped coriander.